First mention of the 2018 ICT in Education Conference in a local paper comes from South Tipp Today, a publication serving 25,000 residents in South Riding. The South Tipp Today article explains the Voices in Education Conference with some specific details. If you want to know how to get ideas heard in classrooms, the Voices in Education Conference in Thurles should be the first place to visit. The event happens on the LIT-Thurles campus on Saturday, April 28. It is part of the annual ICT in Education Conference series with a focus on clever usage of information and communications technologies. 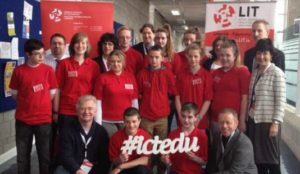 A decade of past conference material appears on the conference website at ictedu.ie with many of the workshops, slide decks, and interviews free for anybody to repurpose in their own work. Jack Allen from Clonmel, a third year student at LIT, explains how “these educational ICT tools improve the way we learn because they lead to improved teaching methods”. The purpose of the conference is to help educators identify effective methods for teachers, educators, lecturers, and practitioners to use so that they may enhance the learning experience of students. The 2018 Voices in Education Conference hosts two keynote speakers, Barney Brown, Cambridge University and Joanna Norton, University of Arts, London. Both will discuss how they work and how they create content to reach a global audience. Conference organiser Pam O’Brien from Nenagh told South Tipp Today, “We want to enable educators from all walks of life to discuss and engage one another so that they may share their own thoughts, ideas and methods for best practice in the classroom”. So the conference schedule allows ample time for networking and conversation with fellow participants, conference exhibitors, and special guests. Members of the Youth Media Team interviewing Maureen Gaffney. The Voices in Education conference will demonstrate how to take advantage of technological platforms and integrate them into the classroom environment. An afternoon of workshops presents materials in hands-on, user-friendly methods. Both augmented reality and virtual reality sessions appear on the programme along with deep dives into software that enhances learning through creativity. Throughout the programme, secondary school students on the Youth Media Team from County Tipperary interview conference participants for podcasts available at YMT.fm. Before the classroom sessions begin, teachers, lecturers, and students will mingle in gazebos erected along the main hallway of the LIT-Thurles campus. Experts from different schools and education centres will explain how to use some of the tech tools that help spark student engagement. A miniature BB-8 will explore the perimeter of one gazebo. Another gazebo features various types of inexpensive VR goggles that teachers can use to see video clips that students have created on the Clonmel campus. You can find details of event by searching for “voices in education Thurles” on Google or Facebook. You can register for the conference on the ictedu.ie website or through the Eventbrite app. And you can follow the build-up and the running of the voices in education conference by watching @ictedu on Twitter.